Less than half of the migrants entering Europe are from Syria. This is correct, according to the United Nations. 48% of migrants and asylum seekers arriving in Europe by sea since January 2015 have been Syrian. The Foreign Secretary’s claim, as reported by the Sun and Mail, is correct. Just under half of migrants and asylum seekers who've recently crossed into Europe over the Mediterranean are Syrian citizens. 48% of people arriving in Europe by sea since the beginning of 2015 have been from Syria, according to the United Nations refugee agency. That’s around 519,000 people. Many others were from Afghanistan and Iraq. The 48% are just the people arriving in Europe, not those who have applied for refugee status, still less been granted it. 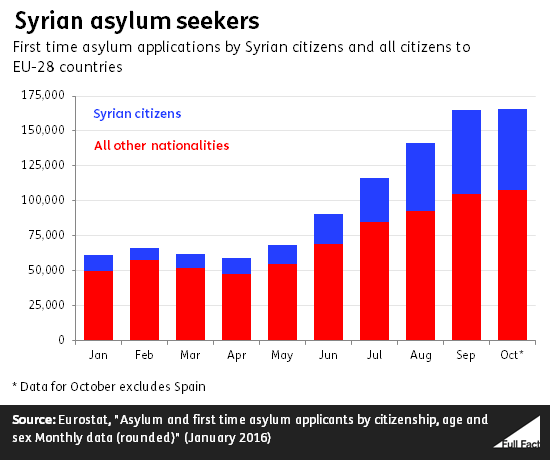 Towards the end of last year, one in every three people applying for asylum in the EU for the first time were from Syria, up from the one in five reported a few months ago. In the first three months of 2015, 16% of asylum applications in the EU were from Syrians. In the next three-month block, it was 21%. In the three months after that—so July, August and September 2015—33% of asylum seekers were Syrian. Overall, 28% of asylum seekers were Syrian between January and October last year. That’s the most recent set of figures available covering all EU countries, except for Spain which hasn’t yet reported for October. Did 1.8 million migrants enter the EU illegally last year? Are only one in five asylum seekers Syrian? Has the UK only taken in 216 Syrian refugees?